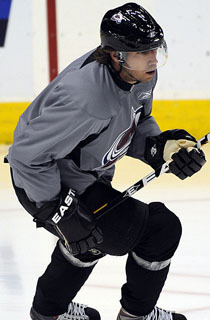 As expected, Peter Forsberg was on the ice today at Pepsi Center prior to Colorado’s game against the Boston Bruins - one day after the Avalanche announced that the forward would begin skating with the team. Forsberg, who arrived in Colorado last night, hit the ice shortly after 8:00 a.m. and stayed on for approximately 45 minutes. He was joined by injured Avalanche forward Ryan O’Reilly and assistant coach Steve Konowalchuk during the pre-game session. The forward, who has been skating with Modo’s junior team in Sweden, wanted to come to Denver to test his oft-injured foot and find out where he is at physically before deciding on his next career move. The Ornskoldsvik native said he believed the only way to fully analyze his health would be to skate against NHL players, so he called his agent, who then made contact with the Avalanche earlier this week to see if an opportunity existed. With Saturday’s skate over and done with, his first test is now complete. But it’s still too early to speculate on what this all means, and whether or not Forsberg might eventually return to the NHL. For now, he’s just happy to be back on the ice in an NHL setting. “I felt okay, we’ll see how it goes,” Forsberg commented after getting off the ice. “I’ve been skating, like I said, most of the whole time back in Sweden. I don’t know how long it’s going to take to really get in game shape, but it’s going to be exciting to start skating if I can skate with the team soon. That’s a relatively positive outlook, considering the injury troubles and numerous surgeries (“double digits,” in his own estimation) Forsberg has experienced during his career. He admits he thought about hanging up the skates “plenty of times” but felt he would be cheating himself if he didn’t give things one more try. There were no set plans revealed Saturday on exactly how Forsberg would be worked into Colorado’s practices, and the forward himself says that you simply can’t put a timetable on his status. Avalanche General Manager Greg Sherman also addressed the media Saturday, shortly after Forsberg. Sherman made clear that there have been no contract talks between the two sides at this point. Contract issues aside, given the bond Forsberg has with the Avalanche organization, the decision to allow Forsberg to practice with the team and find out where he is physically was an easy one for Sherman to make.